This gives new meaning to ‘living out of your car.’ At the June 4 Radical Innovation briefing, real estate developer and compeition founder John Hardy unveiled two exciting new hotel concepts purposely designed for a future in which folks drive long distance travel in driverless cars. Now on its thirteenth year, the global competition seeks radical but plausible proposals for new hospitality environments from professional architects and students. As more auto companies ramp up their autonomous vehicle development projects, designers are anticipating infrastructure to serve the first wave of travelers. One concept by the Los Angeles-based firm Aprilli Design Studioenvisions a compact hotel suite on wheels, equipped with a bed and washroom facilities. Designers explain that the so-called “Autonomous Travel Suite” allows travelers to work uninterrupted on the road, possibly skipping current necessities like rest stops and gas station bathroom breaks. The self-contained unit docks in a tower-like structure once the traveler reaches their destination. 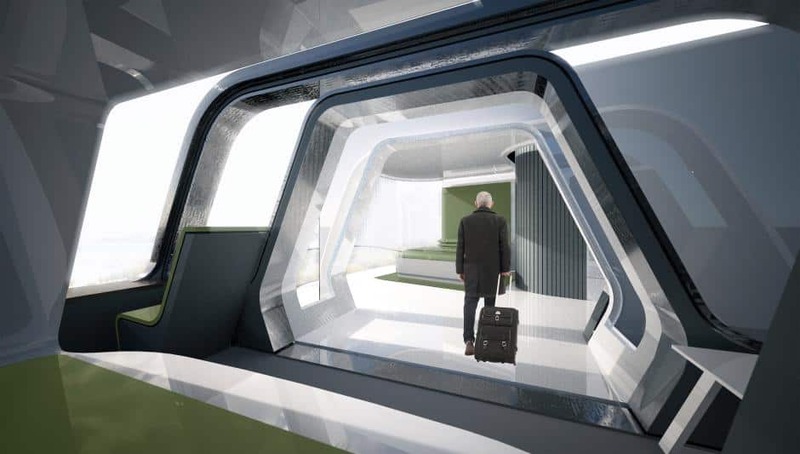 “Acting as both a personal rental car and hotel room, the Autonomous Travel Suite provides both a new way of traveling and an extension of the conventional hotel experience,” the designers explain. Travellers can order a unit via an app. The winning student proposal called “Room Extension Solution” features a mobile hotel room that meets travelers right at the airport. Designed by Cracow University of Technology graduate students Daniel Czyszczoń and Michał Witalis, the bus-sized suite contains a full-size bed, storage space for luggage, cabinets and a bathroom. Hardy stresses that Radical Innovation isn’t about speculative drawings or architectural fiction. “We’re always looking for a balance of radical and practical,” he says, explaining that judges select proposals that can reasonably be implemented in 3 to 5 year timeframe. “This is a full-on continuous process to make it happen.” Past finalist Snoozebox, which provides sleeping quarters at festivals and concert venues, is operational. The Amsterdam-based home-office hotel Zoku which won top prize in 2015, consistently gets great reviews from guests. The winner of the 2018 Radical Innovation competition will be announced in October. Next article The Future of Urban Mobility: Can Europe Stay On Top?